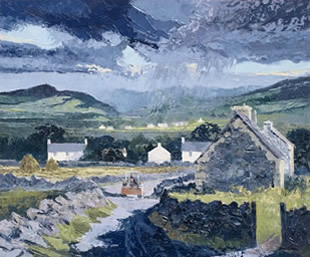 Alan Cotton is one of Britain's most distinctive Landscape Painters. He has been represented internationally by Messum's Fine Art in Cork Street London for the past twenty years, where his annual exhibitions have frequently sold out. Alan writes, "As a child and a young man I was deeply affected by those paintings I saw, where images were conveyed with a sensuous use of paint and the physical surface of the work had the power to excite. As a student and when I first painted on my own I began to experiment by using pigment in quantity, and to explore it’s potential for making a huge variety of textures and marks and allowing me to convey my feelings about landscape. It was then that I took to using painting knives." After he left Art College Alan settled with his new wife at St Briavels in the Forest of Dean and it was there that he was visited by the great Marxist writer and Art critic John Berger, whose views about Alan's work made such an important impact on the young painter. 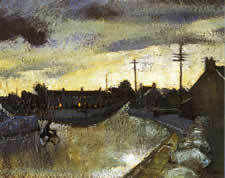 Berger was a friend of the local village doctor John Eskell who asked Alan if he could bring him to see his work. One Sunday morning Alan got up late and still wearing his Pyjamas he was at the bottom of the garden emptying the ashes, when he saw Berger making his way towards him over the horizon. He dashed indoors threw on some clothes and opened up his studio. When Berger arrived he spent the whole day looking at his student work and beyond. On the easel were Alan's first two large paintings made entirely with painting knives. After studying the paintings Berger remarked "You have a great feel for paint and I really think the knife is the way for you to go". Although in those days the artist had hardly explored the potential of the knife and had little notion of using the mark as a metaphor, it was clear that the malleability of oil paint excited him. For Alan this was a seminal meeting. John Berger confirmed to Alan his instinct about the direction his work should take. He has painted with a knife ever since that day." Since that time Alan has painted in many countries. His distinctive paintings are laid on to canvas with painting knives and working with rich impasto pigments, he takes us from the searing yellows and crimsons of the Mediterranean to the cool greens and blues of Ireland and from the sun bleached square in Marrakech at midday to the shimmering reflections of the old Fish Market in Venice. Each painting is distinctively a 'Cotton' yet the variation and contrast gives each one its own identity, what he calls "A Sense of Place". Writing about his work the Artist says "the painting process is always a voyage of discovery. With each new work you should be thrilled with the prospect of actually applying the paint and discovering where you are going, not only with the combination of colours and range of marks, but with the tapestry of the surface which allows you to convey the idea which inspired you and set you off on the path". Over the years Alan has carried out a large number of public commissions including a series that were installed on the main staircase of the Queen Mary II. In 2008 he completed a commission of five large Venice paintings for the Vice-Chairman of a major USA Cruise Liner Company and his wife. These were installed in their Miami residence in December. 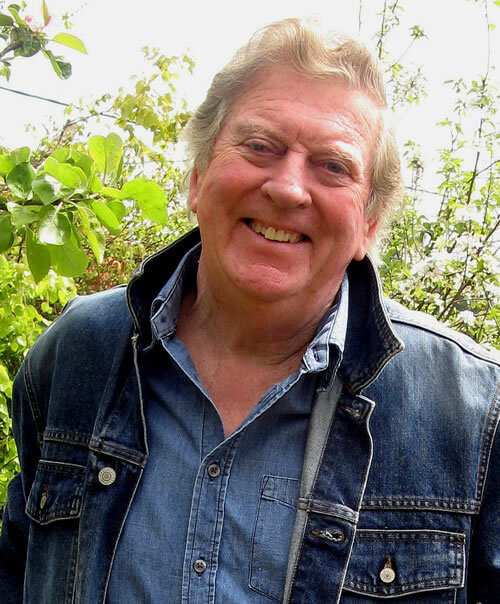 There have been a number of television films made about his work both by the BBC and ITV and he has written, presented and narrated arts films for BBC South West. It was during the making of 'An Artist on Every Corner' - a film about the Newlyn School of Artists that Alan met the man who was to become his dealer and close friend, David Messum. There have been many publications of Alan's work, including fifteen by Studio Publications at Messum's Fine Art, all of which can be obtained from the gallery. In 2003 a copiously illustrated biography "Alan Cotton - On A Knife Edge" by Jenny Pery was published by Halsgrove and is available from Messum's Fine Art or the publishers. 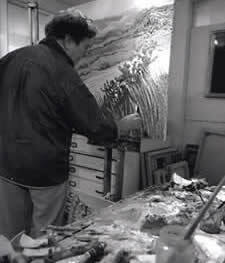 A new biography by Jenny Pery, which looks at relationships of Alan's drawings to his paintings and the artist's relationship with his dealer and his many friends, will be launched in September 2010. 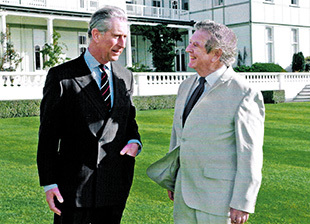 In late February and March 2005 Alan was invited by His Royal Highness, The Prince of Wales to be his Tour Artist and to accompany him to Sri Lanka, Australia, New Zealand and Fiji. Paintings from the tour were exhibited at Messum’s Fine Art, 8, Cork Street, London W1S 3LJ. In 2006 Alan was awarded an Honorary Doctorate (D.Litt) by the University of Exeter for his 'outstanding contribution to the Arts' and in 2011 the Senate of the University of Bath conferred on Alan the position of Honorary Professor of Arts. In 2012 Alan's Private View of his Everest Exhibition at Messum's in London, was filmed by Fact Not Fiction Films. A sequence from this film can be seen on the Multimedia Pages. 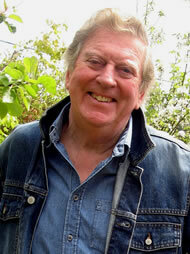 The late Tom Salmon was a distinguished Cornish writer and broadcaster, formerly Head of BBC Television South West.